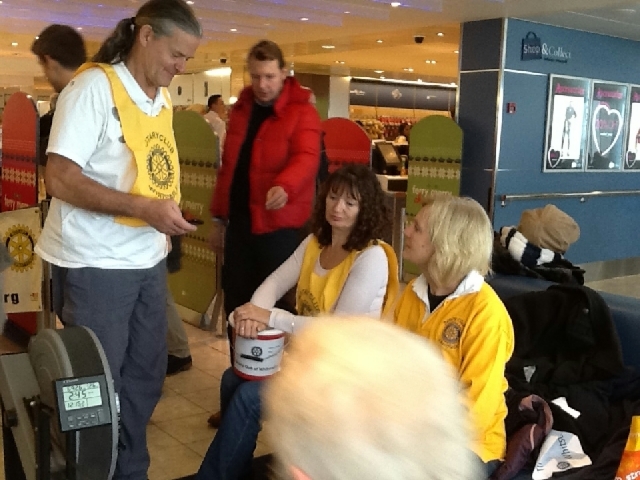 Saturday February 23rd was Rotary Day. around the world. We were outside Whitstable Library all day raising awareness of Rotary and in particular the massive campaign Rotary has made since the mid eighties. In 1985, Rotary launched its PolioPlus program, the first initiative to tackle global polio eradication through the mass vaccination of children. At that time there were 1000 cases/day. Rotary has contributed more than $1.7 billion and countless volunteer hours to immunize more than 2.5 billion children in 122 countries. In addition, Rotary’s advocacy efforts have played a role in decisions by donor governments to contribute more than $7.2 billion to the effort. Today, there are only three countries that have never stopped transmission of the wild poliovirus: Afghanistan, Nigeria and Pakistan. Just 37 polio cases were confirmed worldwide in 2016, and 18 in 2017 which is a reduction of more than 99.9 percent since the 1980s. Rotary will raise $50 million per year over the next three years, with every dollar to be matched with two additional dollars from the Bill & Melinda Gates Foundation. These funds help to provide much-needed operational support, medical personnel, laboratory. Our thanks go to the staff of the libarary that allowed a cable connection so that we could serve hot Tea, Coffee and Cakes to passers by of which there were a steady flow all day - and the weather could not have been better! Our thanks once again go to the Linley Players who provided tickets for their final dress rehearsal on Tuesday 15th January. We had a great turnout from children from Whitstable and everyone thoroughly enjoyed themselves, Oh no they didn't, Oh yes they did! AS usual the club provided bar drinks and an ice cream for all participants. We were outside Tescos & Sainsburys again this Christmas, this time the weather was much warmer (thought still cold). Our grateful thanks to the many people that so kindly gave us generous donations. I can assure you all the money will be well spent on very good causes and local charities. A BIG thank you! Once again saw nearly all members of the club participating in what has become a traditional event for us receiving donations outside Tesco and Sainsbury. It is wonderful to see thelittle children's eyes light up when they see Father Christmas - or is the Christmas sweeties that catch their eye. Seriously though it is so rewarding to see their obvious excitement. A BIG thank you to all that donated. I can assure you it will all go to very good causes - 100%!! 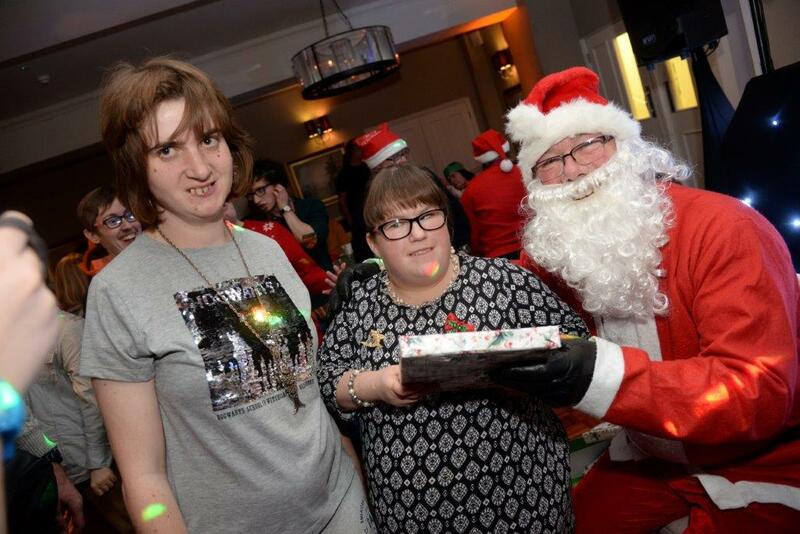 There was much music, dancing, laughter and fun when the Rotary Club of Whitstable held it’s annual party for adults with learning difficulties at the Marine Hotel, Tankerton on Tuesday evening. Rotary Club President Kevin Fielding said “The Christmas party has been a feature of our club’s calendar for well over 20-years and every year it seems to grow in popularity with our guests and is regarded by our members as one of the most worthwhile events of our year”.“This year we had 75 students accompanied by carers, relatives and staff drawn from the John Graham Centre, Strode Park, the Swalecliffe Day Opportunities Centre and Aiding Independence”. 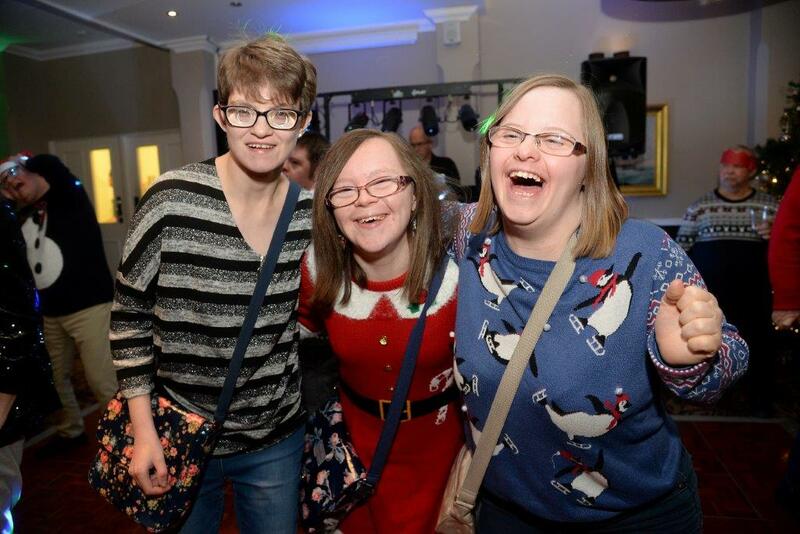 “The disco was very popular and a good number of our guests spent time dancing to the musical selections of DJ Ian Gladwell and no doubt building up an appetite for the sausage, chips and beans supper that followed”.“The evening is a means by which we can include those who find themselves in a less fortunate situation in the social life of the town. We know that all of our guests enjoy the evening, indeed many of them have been regulars almost since we started the event and look forward to the evening each year as do our members”. Once again our thanks go to Shepherd Neame, the Marine Hotel and DJ Ian Gladwell for their continued support and help in running the evening, it was as always a fantastic event”. 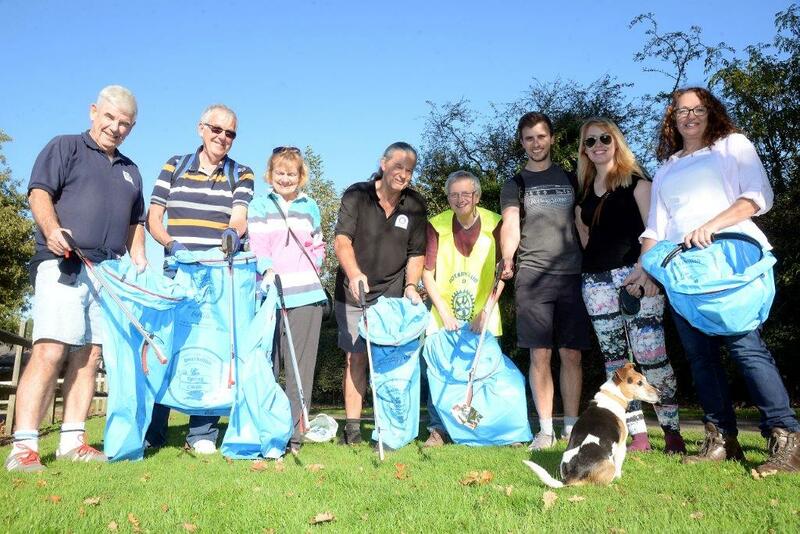 On the weekend 20-21st October Rotary had an environmental Clean-up weekend and we have decided to clear up litter along the old Crab & Winkle Line, starting from the Kent College school car park (off Neal's Pl Road), Canterbury. We are thankful to both Kent College for giving us their car park for the day and to Canterbury City Council that supplied bags, gloves pickup tools etc. Although the walk was surprisingly clear of rubbish we still managed to fill about 4 sacks of litter.Kevin Fielding said “This was our contribution to Rotary’s Environmental Clean Up weekend and like everyone else we are conscious of the issues regarding litter and discarded plastic along our roads and pathways and on Sunday members of our club and other volunteers who took part in the walk collected seven bags of rubbish and we hope has made a small improvement to the environment”. We also decided the walk would be open to the public and despite intensive advertising in local digital media only one couple turned up - So thank you Sam and Emma from Faversham - and congratulations on your pregnancy Emma - we wish you well! Hope you enjoyed walking with us. Members of the Rotary Club of Whitstable have been busy over the last two weeks on projects to brighten popular area of the district. 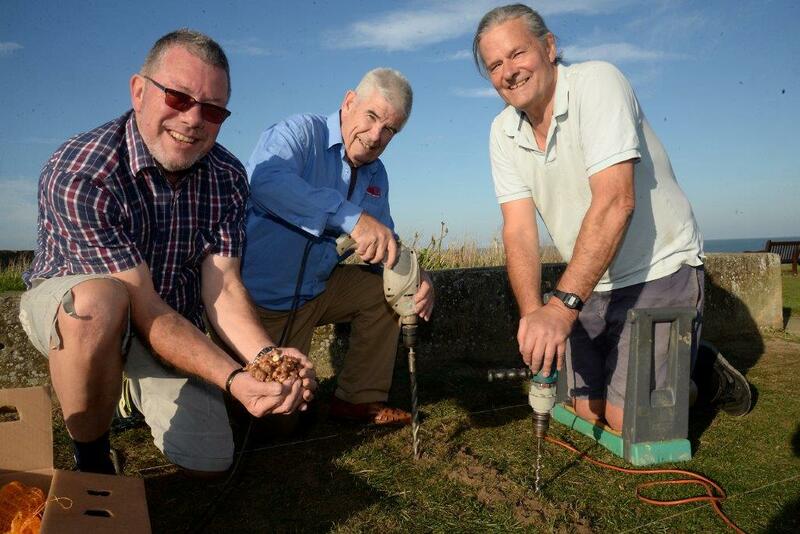 On two consecutive Tuesday afternoon’s members of the club could be found planting up to 5000 crocus bulbs around the garden area built into the former boating pond on Tankerton seafront at the Priest & Sow corner. The project was however not without a snag. On the first Tuesday the ground proved so hard that the battery powered drills used to bore holes for the bulbs soon lost power, but as Kevin Fielding, president of the club explained “Two weeks later the proprietors of the Seaview Café allowed us to run out a power cable from their establishment in order to use mains powered drills to help the situation and we thank them for their assistance”. Kevin Fielding, continued “We are planting the bulbs to highlight Rotary International’s Polio Plus programme which was launched in 1985, to tackle global polio eradication through the mass vaccination of children. Many people do not realise the massive input Rotary has had, and will contiue to have in the eradication of polio. In 1987 there were 1000 cases per day. Rotary has contributed more than $1.7 billion and countless volunteer hours to immunize more than 2.5 billion children in 122 countries”. “In addition, Rotary’s advocacy efforts have played a major role in decisions by donor governments to contribute more than $7.2 billion to the effort. Rotary International is also part of The Global Polio Eradication Initiative, formed in 1988 that includes the World Health Organization and various government departments the world and Rotary play’s its part in fundraising, volunteer recruitment and awareness-building of issues connected with polio with the result that only three countries reported 22 cases in total. Quite a result! Many Rotary doctors and nurses that have given their time to this terrible illness." “We hope that by planting the bulbs we can highlight Rotary’s continuing work in this field and in addition brighten up the area around the garden in the former pond which our club took over some years ago but we admit has become rather neglected in recent times, something we intend to rectify” .“Our club is always looking for local projects to support in addition to our other causes we support both local and international and on that note we are very keen on recruiting some new members”. We visited Martha's Trust near Deal to present a cheque for £500 to Kerry Rubins who gave us a talk on this wonderful charity that looks after the severely handicapped residents. We astounded by the dedication and genuine affection given to these residents by the staff. One often hears a host of bad stories re carers etc. today but the staff here could not be further at the opposite end of the spectrum - They were wonderful! 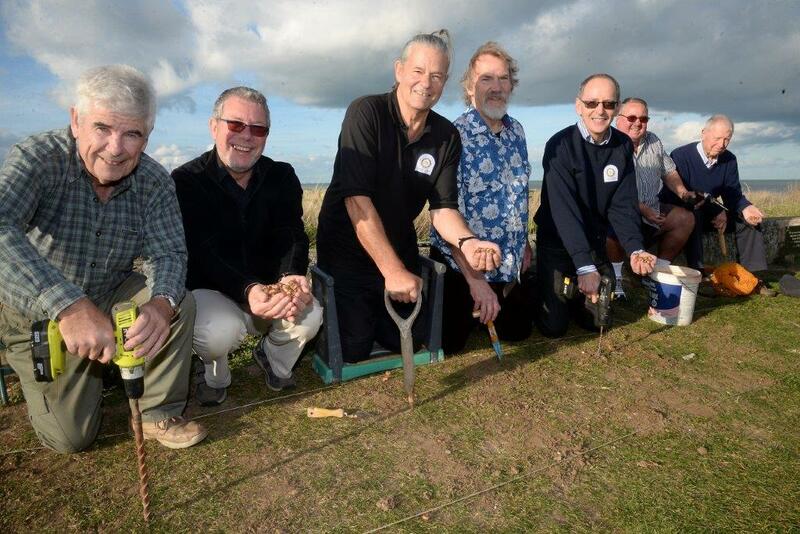 We had purchased 5000 crocuses to highlight the huge effort Rotary as made in eradicating polio with the intention of planting around our Rotary garden on Tankerton slopes and so with drills and forks we arrived on Tuesday afternoon. Only one problem the ground was so hard we could not even make an indentation with the fork and the drills soon ran out of battery power, but we managed to get probably 200 in and decided we would come another day after some rain had made the ground softer! Had my first District (1120) Conference this weekend held at the University of Kent in Canterbury - which was fantastic! 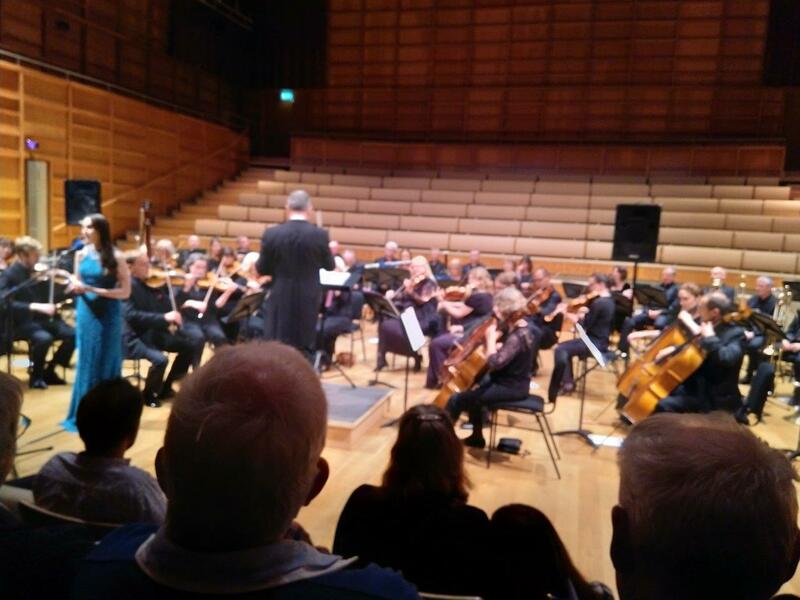 The speakers weren't just good they were exceptional but I guess the highlight of the whole event was the Proms Concert on Friday evening by the Kent Sifonia Orchestra conducted by our very own Past President Steve Wassell - I felt very proud of being a Whitstable Rotarian! Those who did not go really missed out! I shall definately be there next year, especially as it is being held in Canterbury again. Whitstable Rotary partly sponsored the choir St. Nieppe St.Martin who came over from France to sing at St. Mary Bredin Church, Canterbury. Entry was FREE but a collection was taken at the end of the recitel in aid of Macmillan Cancer Support. The director is Pascal Codron. 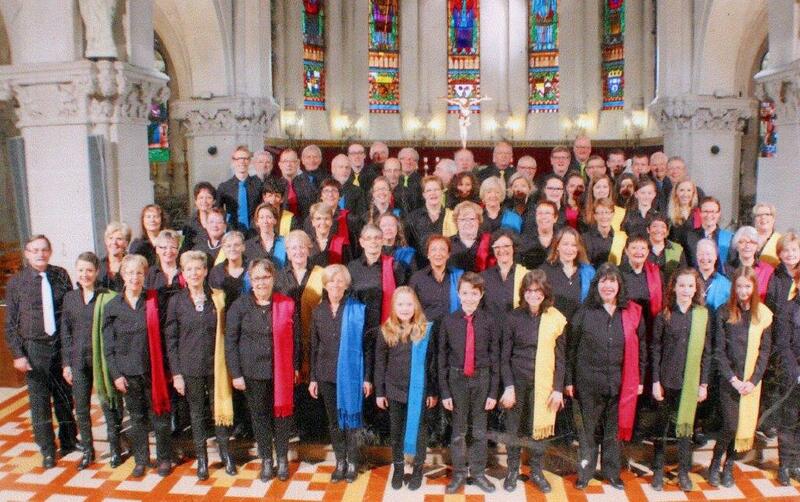 The choir is quite famous in France and is very popular. We were pleased to see a good turnout - but there were still plenty of seats vacant. To say they were great is an understatement! Their vocal harmony, timing were just superb but their choice of music was outstanding especially an African song. The weather ofcourse was superb which greatly enhanced the beautiful gardens of St Marys. Those who did not come missed a very moving event. Nieppe is a little rural town of 7500, close to Lille. The choir is like a large family covering all ages from 7 to 77 years. They have no musical barriers so a wide variety of music for all tastes, but above all they all share a great desire to give their time and musical expertise to the public. Since 1981 many young people have joined the choir and for some it is their children who also now belong - all with the same conductor Pascal Codron at their head. They rehearse every Friday evening in the church of St Martin de Nieppe and cover many genres (Handel, Mozart, Vivaldi, .... Gospel, French and foreign songs. They are reguarly seen on Sundays in the church but also cover weddings etc. and give outside concerts with all the money raised going to charitable organisations. Aside from the regular rehearsals they meet in November to celebrate Saint Cecilia - the patron saint of music. At the end of the academic year they leave for a weekend away at many different destinations. In April 2016 they celebrated their 35th anniversary with two exceptional concerts which attracted over 1500 people all in aid of "Medecins Solidaires Lille". Maybe we can make this into an annual event! 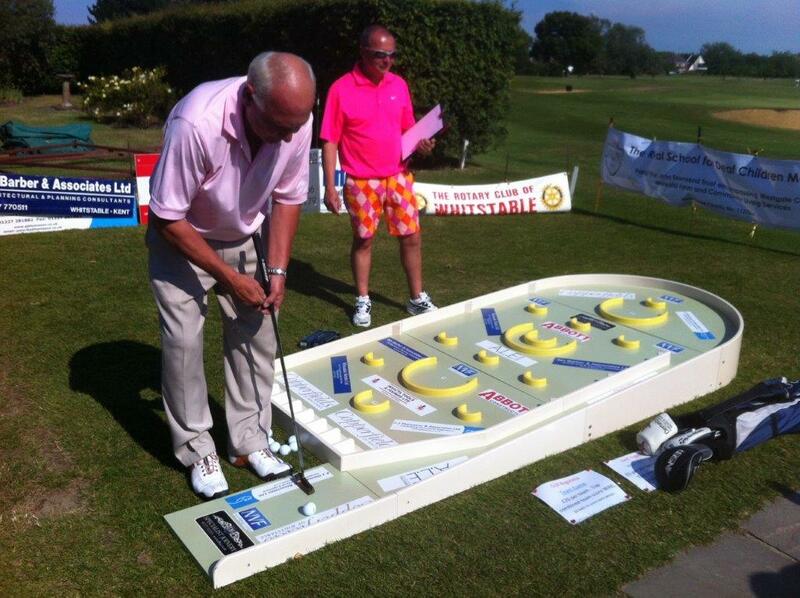 £7000 has been present to the Prostate Cancer Support Association (Kent) through the combined charity fundraising activities of the Rotary Club of Whitstable and Chestfield Golf Club. Past President Malcolm Ramsey, in whose year of office the funds were raised said “These funds will go towards purchase of a BK bladder scanner and probes for use in the Kent & Canterbury Radiography Centre, which is part of the Maidstone Trust”. “The price of this scanner is £48,800 and an additional cost for of £15,000 for a rectal probe used in the insertion of beads into the prostate to target radiotherapy treatment. 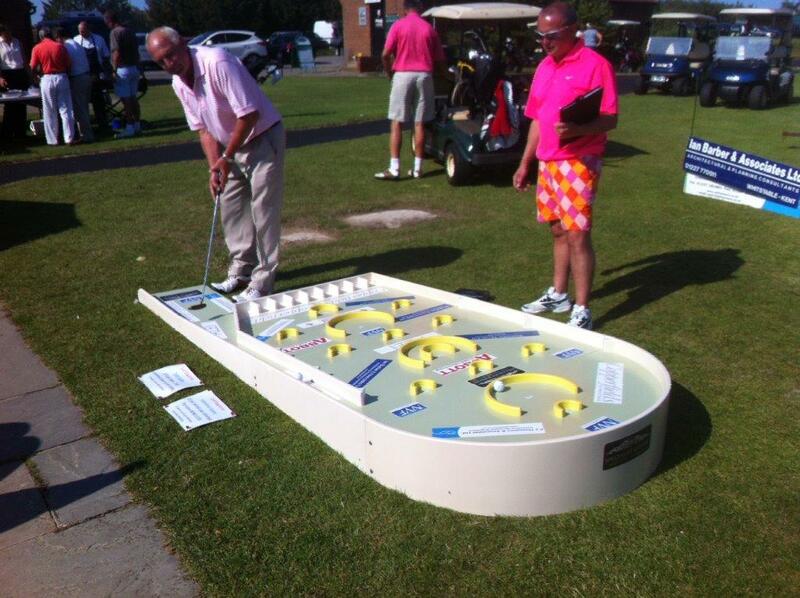 This equipment purchased for our Kent hospitals will help to save 100’s of lives every year and both the rotary and golf club members a pleased to have been able to make this donation to the cause”. Terry Laidlaw and Graham Edwards, from the PCSA Kent, told the club that “Prostate Cancer affects 1 in 6 men in the UK and is a cancer that hits ‘below the belt”. 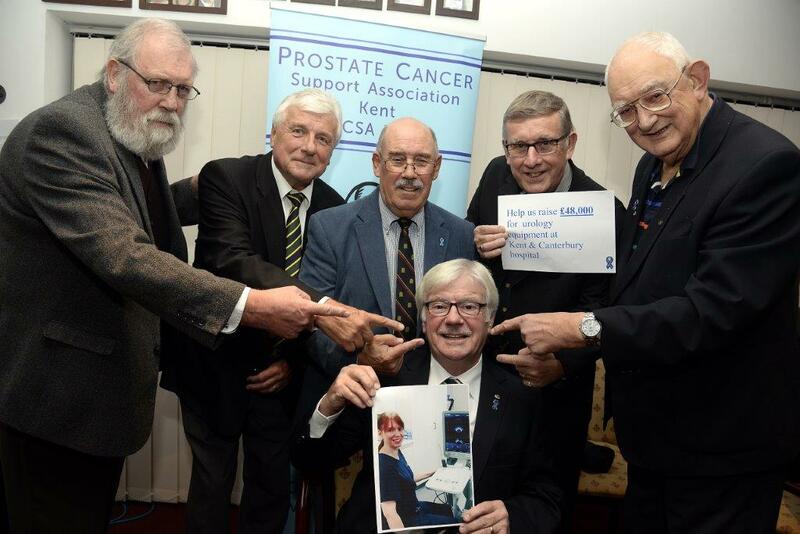 PCSA Kent was formed in 2006 and is a patient led organisation supporting those affected by prostate cancer. 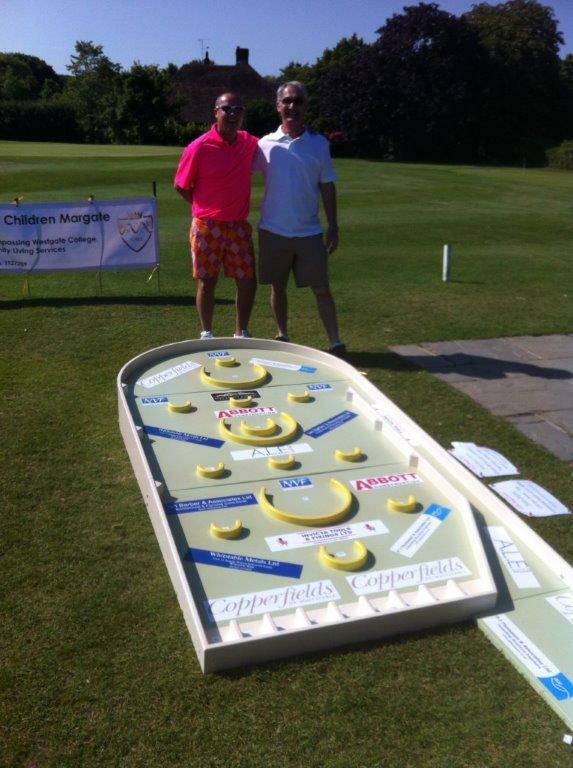 The charity is also involved in raising public awareness of the disease and has a successful fundraising programme which aims to raise funds for medical equipment and training within the hospital specialities that provide care for prostate cancer patients”. First a big thank you to the general public for their very generous donations (£4727.30). I can assure you this money will be well spent on deserving people and organisations. These two collections are one of our main charity event of the year - and this year it was particularly pleasant as in general the weather was very good. Our tanks to Mike Bantin for organising the two events and a special thank to Sharon Perry to not only did 14 2 hour slots but also raised a lot of money from her workplace. 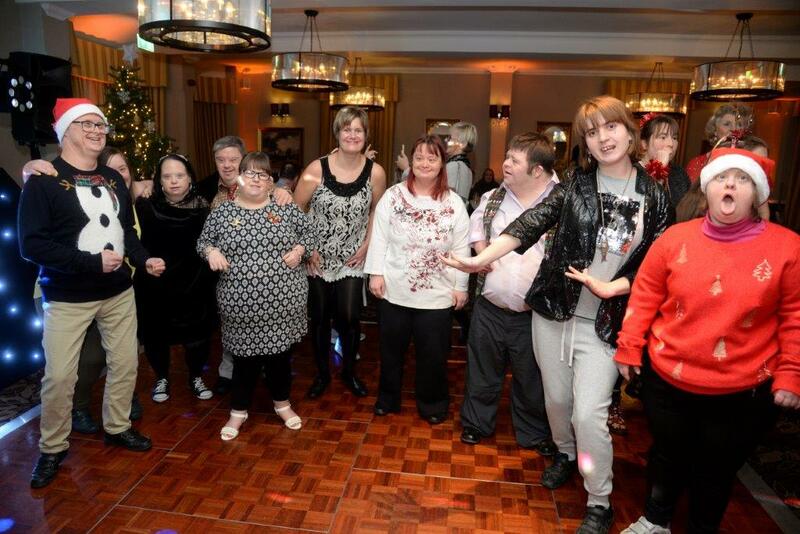 Once again the dinner and disco party for the learning difficulty students was a huge success, with lots of very positive feedback from parents and carers, and even a spontaneous kiss and hug from one female carer to our President Steve! (Bonus)! Many thanks to all who turned up to assist, especially David Cavell, our very own Santa, and very special thanks to Mike Bantin for organising it and entertaining us with his dancing! Our thanks also go to Shepherd Neame who annually sponser this event. This is what Rotary - having a great time, but also providing a very worthwhile event much loved by very deserving people - is all about and we felt quite moved by the way the students greeted each other with hugs after a year's absence. We have also made a potential new recruit with one of the dad's showing an interest in what we do! We also need new Rotarians! 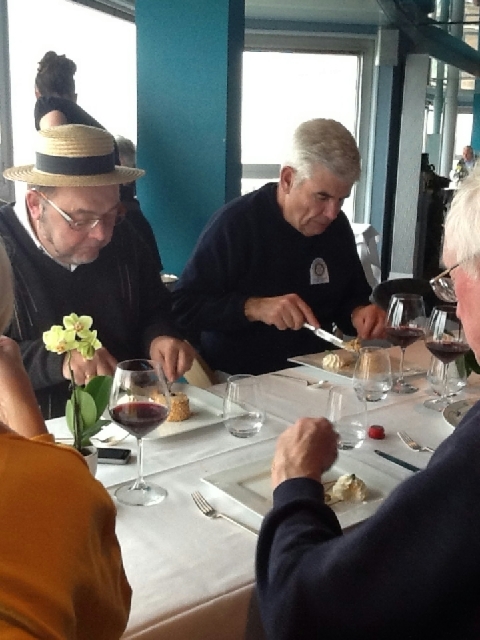 We welcomed and entertained Rotarians from Hazebrouck-Merville. The main purpose of their visit was to attend the Handover meeting on the 5th. 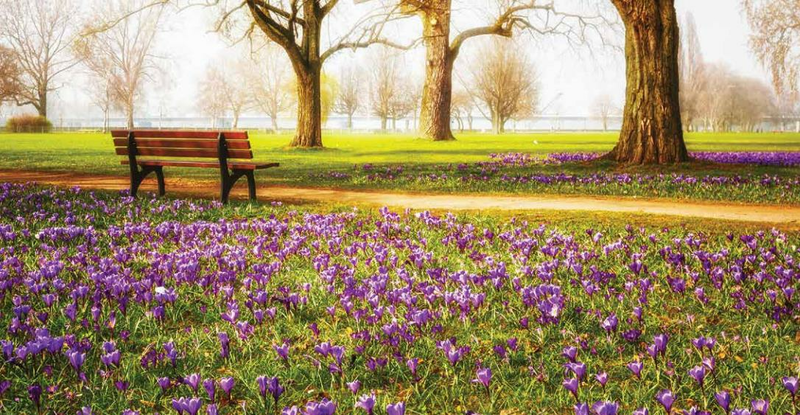 President Malcolm has arranged for several events in and around Whitstable, Broadstairs and Margate, including afternoon tea and aperitifs in Malcolm garden, a meal at the Minnis Bay Brasserie and bowls in Cliftonville. They stayed the night on Monday 4th July and they returned. Malcolm commented that our visitors thoroughly enjoyed their visit. Congratulations to now Past President Malcolm on a great year and we welcome President Steve for this new year 2016-17. 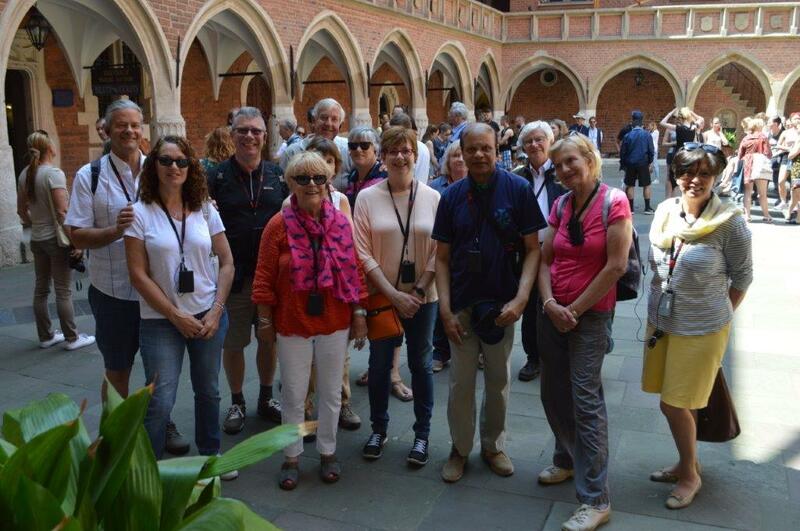 On May 26th 2016 thirteen people, made up of seven Whitstable Rotarians, one Chestfield Rotarian, four spouses and one friend, travelled to Krakow in Poland for a four day meeting of our contact club from Cham in Germany and their contact club from Eisenstadt in Austria. 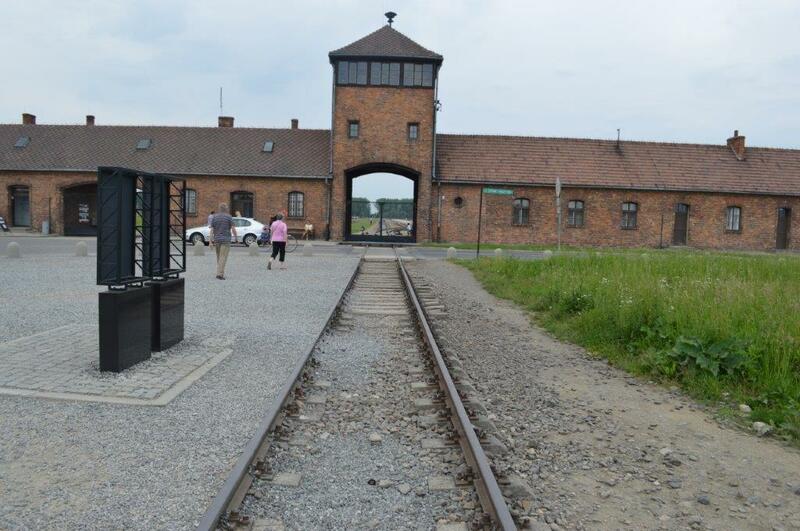 We had an enlightening few days with glorious weather, visiting Wawol Castle, the Jewish quarters, Schindler's factory, the local citadel and on the final day, a very poignant trip to Auschwitz.The whole event was organised by the Austrian Rotarians, led by Lucy Schindler (no relation), the wife of one of their members, who did a sterling job with organising accommodation, meals and travel arrangements whilst in Poland. Plans are afoot to invite Cham club to Whitstable in 2017, and to meet up with Cham and Eisenstadt in Austria in 2018. It was a very memorable tour which will be regarded very fondly for years to come. 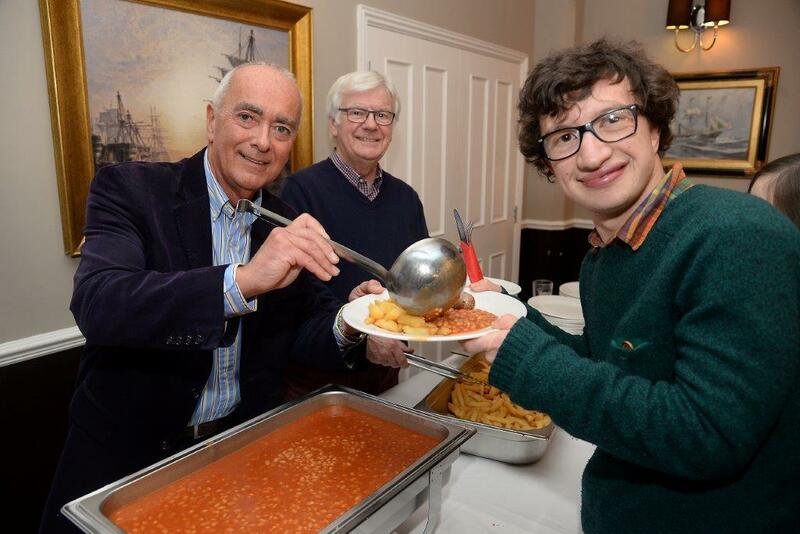 Whitstable Rotary Club held a Charity Film Night (in the afternoon!) 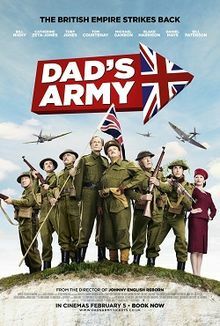 of the new Dad's Army film, released on February 6th, which was well attended by local people. The event commenced with a glass of champayne and canapés It has a great cast of English actors and actresses and a good screen writer and director and was a great laugh,The National Anthem at around 4.30pm!!!!! - takes one back!. The picture below shows Rotarians Brian White & Brian Brooks in "fancy dress"
a good proportion of the ticket price is going direct to charity - Hounds for Heroes. 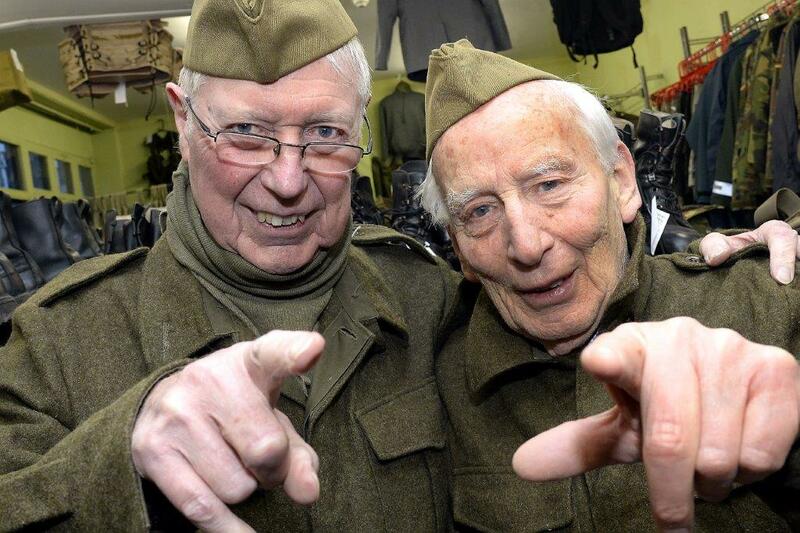 If you fancy dressing up in a World War theme - all the better! 14th – 18th April 2015: A cycle tour to Arras, joined by Hazebrouck-Merville Rotary Club at St Omer, who took us to see La Coupole, where Hitler manufactured and launched many V1 (doodlebugs)and V2 rockets, followed by a tour of St Omer Cathedral, and later they took us for a meeting and a meal in an exclusive restaurant. A speech was given by Patrick Boortel, welcoming us to France, and a reply was given by David Cavell. This was followed by a multi-course meal. The following day, several Hazebrouck Rotarians joined us on the ride to Arras, stopping for lunch halfway there, then returning home. We carried on to Arras where we stayed for two nights, visiting Wellington Caves, the secret jumping off point for 15,000 allied troups, Vimy Ridge, the Canadian war memorial, and Notre Dame de Lorette, the French memorial. We then cycled back, once again staying overnight at St Omer. 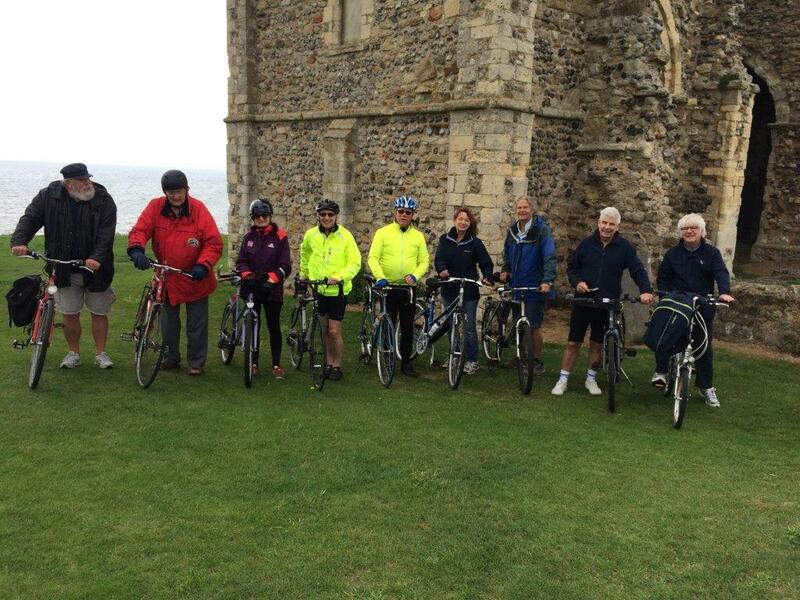 The trip raised £1.530 for the Kent, Surrey and Sussex Air Ambulance. Six Fellows and two partners/spouses travelled to Hazebrouck-Merville to join with our contact club for their “Masse de Souvenir”. This is an act of remembrance for their deceased members and included members and their partners, friends and relations of the deceased. The service was a simple, moving Roman Catholic mass with a splendid accompanying choir and organ and particularly memorable, was a solo harmonica player! The Service was held in the church of St Thomas of Cantorbery (the French spelling!) We then ventured to the next village to visit a recently completed restaurant for a champagne reception and a three course meal. Unfortunately, after much warmth and friendly banter, we had to eat our sweets hurried before the French ate theirs in order to travel back to the tunnel terminal. 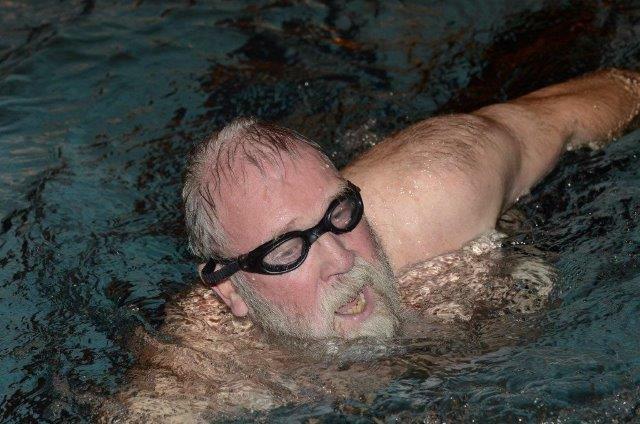 Whitstable Rotary Club President David Cavell has raised around £600 for the Kent, London Policeman and cabbie completed his 2km swim in one hour which considering he could only use his arms was some achievement. David was accompanied in his swim by fellow Rotarians Ted Rooney (who also swam 2km), Mike Bantin and Piroska Cavell along with Granddaughter Sascha Said David “The ‘Merman’ the costume was made by my wife Marika and was very realistic however I am not sure that it aided my swimming as by the end of the event I was pretty tired, however around £600 will go to the air ambulance and I thank all those who have sponsored me and to the Whitstable Pool for allowing us to raise the monies for a very worthwhile cause. In addition and at the request of the pool staff, £50 will also go to the RNLI as it is their chosen charity”. Knowing how important the Tour De France is the Frence we organised this weekend for our parnter club Hazebrouck to view in England, so arrived on the Saturday, we have an excellent lunch at Kevin &Kathryn's followed by watching Stage 1 on the television. In the evening we dined at the Table Table opposite their hotel. On Sunday the weather was not to kind but we walked through Canterbury seeing some of the many sights before arriving (late!!) at the Old Neptune pub in Whitstable for a light lunch and a walk along the prominade to the Castle as the sun materialised, followed by an evening meal at the Long Reach. On Sunday we had organised a 14 seater bus to take us to London to view the race, ably collected & driven by Steve W. Arriving at the O2 we took the river bus to Westminster and then walked to the Union Jack club for a quick lunch before returning to Tower Hill to watch the race, then back to the O2 and drive back to Brenley Corner for the French to return to Folkstone (Organiser Kevin Fielding). On Saturday 29th March Whitstable Rotary completed this years Rotary Dog Walk. Starting and finishing at Strode Park and through local woods, it lasted just over one and half hours, the walkers and their dogs arrived back at Strode Farm for a cup of tea or coffee and a good hose down for the dogs, as although very dry for most of the walk, there were some distinctly unavoidable wet places. Most of the dogs thoroughly enjoyed being hosed down afterwards before getting back in their owners cars. It was lovely to see an assortment of dogs, some big some small, race around the fields. Whitstable RotaryÃ¢s President Andrea Gough came with his wife and beautiful greyhound (name???) Attracting some people from as far away as Redhill, Whitstable Rotary raised £100 for "Hounds for Heroes" - and the weather could not have been better, everybody and a thoroughly good time. Kevin Fielding, the organiser said This is Rotary - we like helping charities  but we like to enjoy ourselves at the same time if possible! After months and months of arduous training, 4 stalwart, super fit Rotarians made their way early on a grey misty Saturday morning in December to Dover to row across the English Channel. Arriving in Dover and looking at the mountainous waves we realsied the enormous challenge we had set ourselves  and that was just in the harbour! We did have two Rotarians AWOL, apparently one found his passport had expired and the other a business meeting  poor excuses, obviously chickens!